Sometimes I wonder why I try. Leela loves to burrow into blankets to stay warm especially in the winter, but that’s gotten difficult now that she’s older and blind and I worry that she’ll get cold if we’re not there to cover her with a blanket. 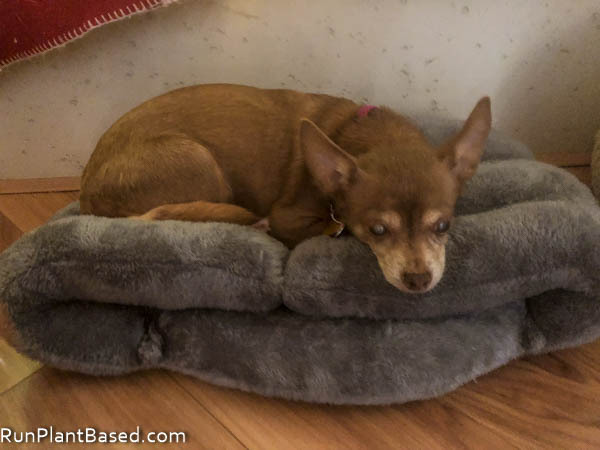 There are pet beds that allow dogs to burrow into, but I haven’t had much luck getting her to use them. We decided to try this bed since the top stays up and it’s very cozy for her. Well, she still refuses to climb into the cave and prefers sleeping on top of it. Still after I showed her how to climb in and tucked her into the cave multiple times with treats. Sigh. 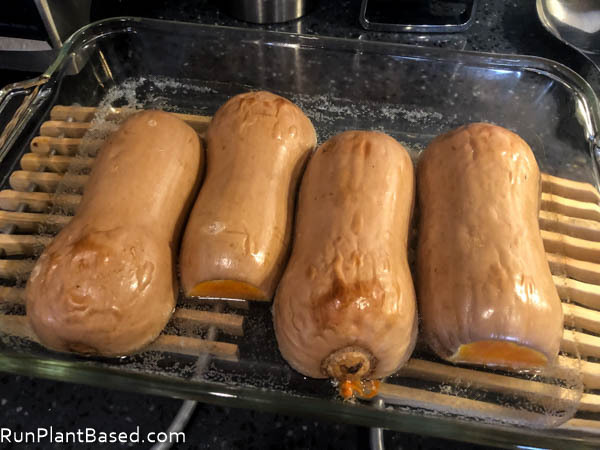 I’m getting the hang of roasting butternut squash to use for the week, I had two small squashes to use up and roasted them both together for simple meals and recipes during the week. And I’m obsessed with using it to make creamy, veggie-based pasta sauces. 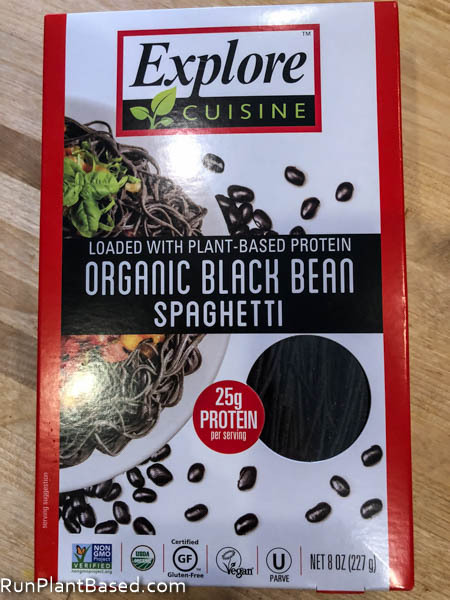 Absolutely perfect paired with high-protein bean-based spaghetti such as Explore Cuisine Organic Black Bean Spaghetti. 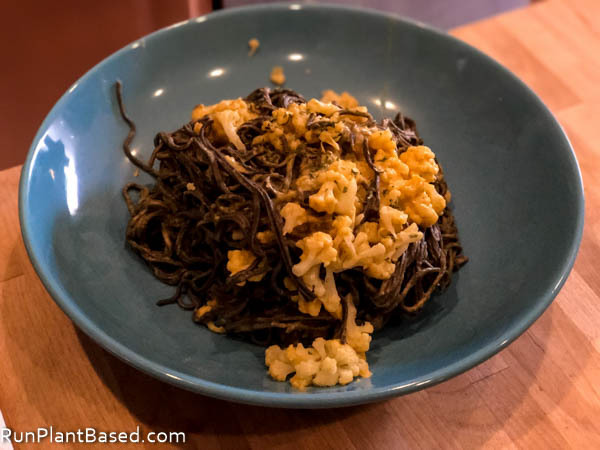 Creamy pasta is such a comfort dish that can also be insanely caloric and bad packed with empty carbs and fats. But this butternut sauce gets a creamier texture from tahini, packs lots of garlic, miso paste instead of salt, and a bright and playful smoky flavor with fresh rosemary – perfect flavor blend for a chilly winter meal. 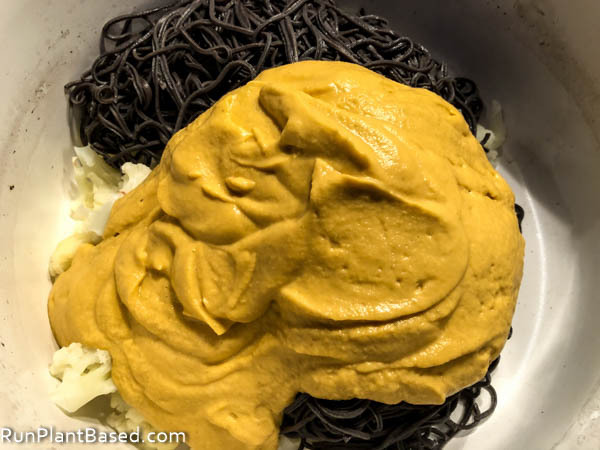 It’s thick, super thick, creamy, gloppy, and perfect for coating spaghetti. I added steamed cauliflower to bring more veggies to this party and the creamy sauce worked perfectly with it. And whew, it created a hearty, warming, and filling dinner with a decadent creamy, smoky, and rich flavor. Enjoy creamy spaghetti with this simple sauce! Yum, I love roasted butternut squash. It’s the perfect winter vegetable. Haha, so frustrating. So true for butternut squash and versatile. Hi Christine! It has never occurred to me to make a sauce for my squash. I should! It would encourage my hubby to eat it. He flipped out on my over the Brussel Sprouts last night =( We’ve been doing lots of simple, squashy meals here too, mostly spaghetti squash! Haha, what is it with some guys and eating veggies?!? Yes, making veggie based sauces is a great way to sneak more in. This pasta sauce seems like an ultimate recipe, Christine. 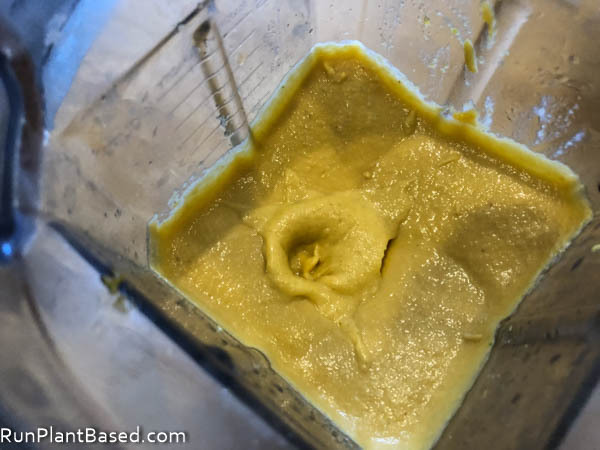 Can I use lime instead of lemon for this recipe? Thanks and sure, or even apple cider vinegar would work too. I love all things smoky but I would have never thought of this unique flavor combination! Between that earthiness, the sweetness of the squash, spicy notes of chili and herbaceous rosemary, it sounds like something really special. Yes and thanks, the smokey and tahini really add to the squash flavor and texture. Yes, this recipe is a perfect treat when temps start to cool.